If you are embarking on the giant task of renovating your house or doing something as small as moving furniture, this is a great read before you go any further. Interior designer Paige Rien gives you 40 ways to create a home that doesn't come from the glossy perfected pictures in a magazine. Instead she challenges and encourages you to create a home that is reflection of who you are and what works for your lifestyle and budget. Stop hating your house and start adoring it—40 steps to make your home express who you are and work for how you really live. • Explore your life story: Mine your life for those things that inspire nostalgia and create a positive connection to memories, explore your family’s heritage, and be conscious of how you want to live now. • Understand what you’re working with: Take stock of your stuff, understand the history of your home, and get clear on the space you have. • Create an inspired action plan: Discover how to ap­proach design room-by-room, find the through line that ties the whole house together, and work in ways that empower your own ideas and creativity. • Learn the design skills that matter: Get tips on pick­ing paint colors, choosing window dressings, arrang­ing art, and more. When you start decorating your home with you as the starting point, you can create a highly personalized space that reflects your past, your future, and how you want to live today. In the process, you’ll gain the confidence and inspi­ration to come up with a functional and fabulous living space that’s just right for you and your life. 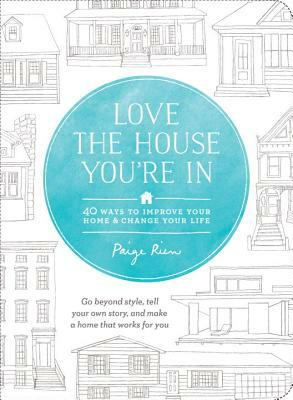 PAIGE RIEN, interior designer, mother of four, and passionate home lover, wants you to love where you live and believes you can do the work to get there. She consults with families all over the world to make interior design accessible, friendly, and multidimensional, encouraging clients to bring their whole selves into creating a home. Paige was one of two designers on HGTV's top-rated Hidden Potential for five seasons. She also appeared on HGTV's Curb Appeal and was the winner of Pier's 1 Imports' Design & Conquer Challenge in 2011, a contest featured on YouTube in four webisodes. When she is not working on a television project, she is helping others make real changes in their homes with a dynamic, creative, and spiritual approach to home improvement, or diving into the next project in her own home outside Washington, DC.